Messages are sent from plugin administrators to a centralized location inside the RepFiles app. You will only receive messages from plugins you have installed. The message icon in the main screen menu will appear green whenever you have an unread message. When you select the message icon, you will be taken to a list of read and unread messages. Here you can select a message to view it, swipe a message to the left to delete it or mark all as read. If you select a folder included in a message, you will be taken directly inside of it. If you select a file included in a message, you will be taken directly to that file. The file will immediately open if it has already been downloaded. If the file has not been downloaded, you will be prompted to download it. Push notifications are messages sent from plugin administrators that appear in your device’s notification center. You will only receive push notifications from RepFiles and the plugins you have installed. Push notifications can be turned on/off per plugin, for all plugins or for the entire app. 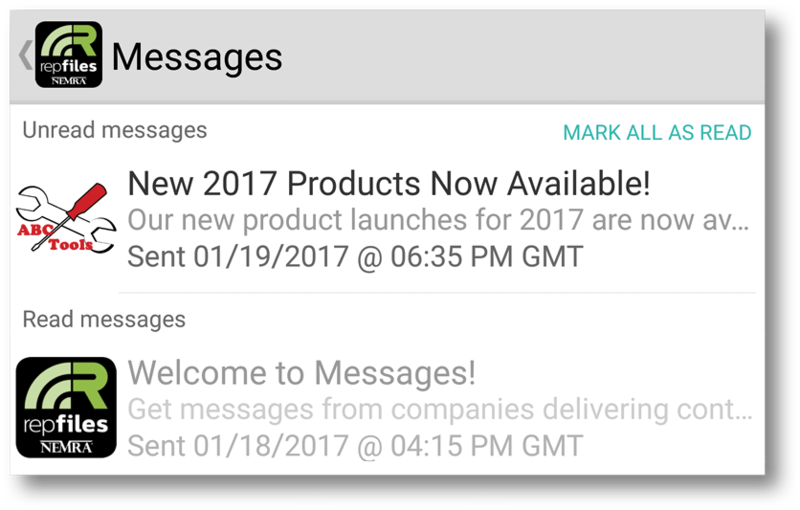 If a push notification is selected from your device's notification center, you will be taken to the full message inside the app. To turn off push notifications for a specific plugin, long-press (or right-click) on a plugin icon that you have installed on the main screen. Then select "edit." Here you can enable/disable notifications for this plugin. To turn off push notifications for all plugins, select "options" (or the settings icon) from the main screen menu. Select the advanced screen and you can enable/disable notifications for all plugins and/or those sent from RepFiles.